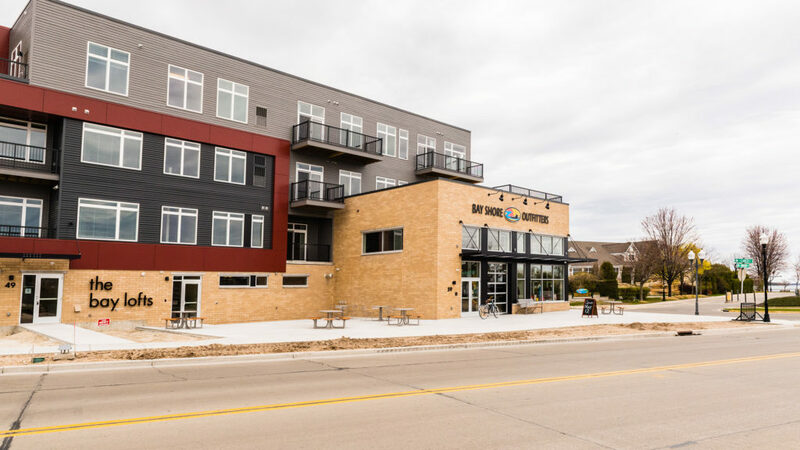 The Bay Lofts apartments opened in Sturgeon Bay in May to great fanfare, one of the first major projects completed in the new west waterfront district.Photo by Len Villano. Those who have not been through Sturgeon Bay in a while may be surprised at the new urban feel to Madison Street with the opening of The Bay Lofts luxury apartments. The site is the former home of the Harbor Place Shoppes. The building has 37 apartments, including 10 one-bedroom units, 22 two-bedrooms and three three-bedrooms. The doors opened on May 1. Laurent described The Bay Lofts as the follow-up project for his company and his build partner, Jeff Gillis, after completion of Middleton Station Apartments in Middleton, Wis.
Oddly enough, Schuster said that when he and his business partner Rick Wylie were first looking to add a Sturgeon Bay location in addition to their Sister Bay store, they wanted to be on the very corner where their new store is located. Schuster said it was former Door County Economic Development Director Bill Chaudoir who introduced him to Laurent. “We’ve been working with these guys for over a year. They’re great to work with, and it fits with what we need in this market,” Schuster said. In addition to selling and renting paddle craft, Schuster said the Sturgeon Bay store will offer bike rentals of 24-speed urban trail bikes. “With the Ahnapee Trail, historic Sturgeon Bay and Potawatomi State Park, all just minutes away from our front door, it just makes sense,” he said. 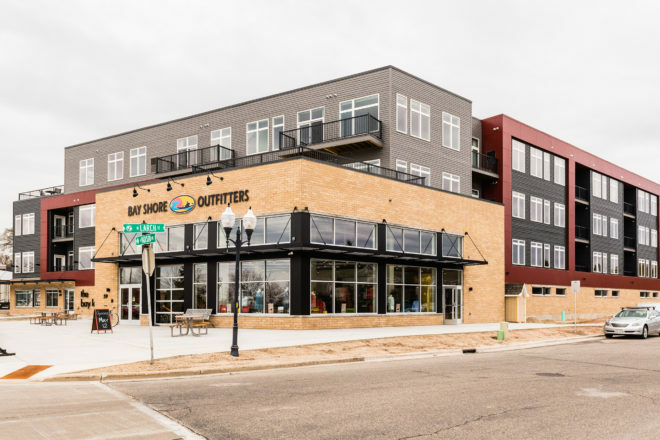 The Bay Lofts apartment complex includes the new retail home of Bay Shore Outfitters. Photo by Len Villano. The store also has an outdoor patio that Schuster said he hopes people use as a gathering space, in addition to activities the store plans to hold in that outdoor space. The store officially opens May 12. Laurent said he had a great experience working with Sturgeon Bay officials and looks forward to working with them again in the future. Laurent is personally excited by the renaissance taking place in Sturgeon Bay. A ribbon cutting will be held at The Bay Lofts at 3 pm on May 19. “The public is invited,” Laurent said. There will be remarks by the development team, new DCEDC Executive Director Caleb Frostman and Mayor Thad Birmingham. Bay Shore Outfitters will celebrate with activities, drinks and food from 5 to 9 pm.